Hunkered down on the cement walkway to the visitor’s building at Natural Bridge State Park in North Adams, I was happily shooting some camouflaged looper larvae — caterpillars who dress up in pieces of vegetation! —on some landscaped flowers along the path. I have to say, these loopers are tough to shoot with their fluffy clothing; there aren’t a lot of flat edges on dressed up caterpillars. I leaned back and took a deep breath to stem the frustration, when I looked down and saw a jumping spider looking back up at me from my pants. That was a pick me up! Especially with such a neat species — check out those elongated, horizontally-held chelicerae — that I don’t often find. I didn’t get as many shots as I’d hoped (I was still a bit stuck on the loopers), but I managed this one on my finger. I put the spider on the flowers but it disappeared on me more quickly than I expected, I guess. I went back to the loopers, and after many more shots I think I may have gotten some usable ones. Those will have to wait for a future post however. 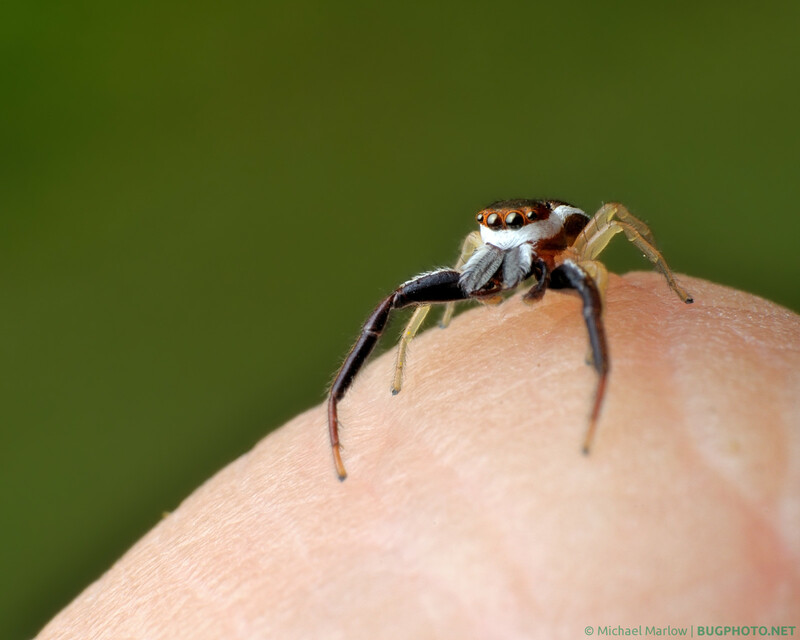 Posted in Jumping SpidersTagged bug on a finger, bug portrait, Hentzia palmarum, jumping spider, Macro Photography, Salticidae, surpriseBookmark the permalink. Great shot. Very sharp even when enlarged. I’m still looking for a video macro camera. I’d like to be able to get some sharp photos from freezing frames of videos. Not sure if I’ll ever get as good as yours though. Jumping spiders in particular LOVE to land on the camera. If you polled spider photographers, I’m sure it’d be listed as one of their top calling cards. I think generally it’s seen as a sign of curiosity, and adds to that dimension of personality that makes jumping spiders uniquely loved among their arachnid brethren. One of these days, I really am going to get my “how to” series of posts up on the site (I have a couple written already). Also planning a post with videos I have taken with my usual set up. I will keep in mind the freeze frame, which is something I haven’t tried or even really considered since I’m taking stills all the time. But now that camp is over, sad as it is for me to say that, maybe I should have time to get some of those posts out.